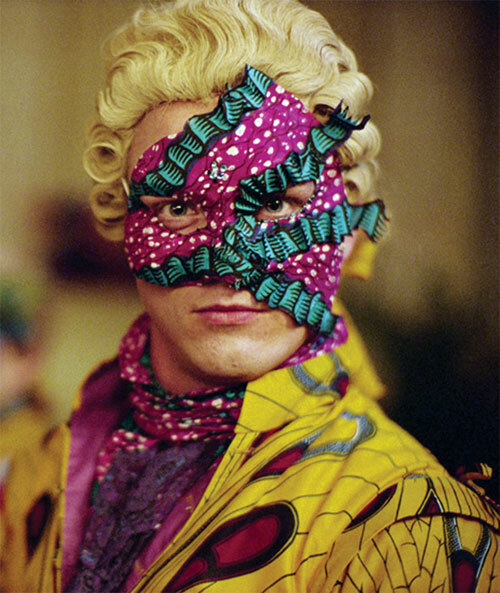 Un Ballo in Maschera (A Masked Ball), 2004, color digital video, 32-minute loop. Images courtesy of the artist, James Cohan Gallery, New York, and Stephen Friedman Gallery, London. Yinka Shonibare first came to widespread attention through his use of Dutch wax fabric, which he has used both as the ground of his paintings and to clothe his sculptures. This bright and distinctive fabric was originally produced in Dutch Indonesia, where no market was found for it, and subsequently copied and produced by the English, who eventually sold it to West Africans, for whom it became a popular everyday item of clothing. It also, crucially, became a sign of identitarian “authenticity” both in Africa and, later, for Africans in England. A colonial invention, Dutch wax fabric offers itself as both a fake and yet “authentic” sign of Africanness, and Shonibare’s use of it in his paintings and sculptures accentuates a politics of (in)authenticity by simultaneously presenting both the ideal of an “authentic” identity and identity as a “fabrication.” Although he has been producing mostly installation-based work of late, Shonibare is also an accomplished painter, and that is where his practice began in the ’80s. It is also easy to overlook, in all the theorizing about postcoloniality and the politics of identity, the amount of amusement and frivolity he can pack into his work. Shonibare was recently nominated for the Turner Prize and used the opportunity to screen his first film, Un Ballo in Maschera (A Masked Ball), 2004. Taking as its starting point the controversial figure of King Gustav III of Sweden, who was assassinated in 1792, Shonibare weaves an intricate and enigmatic tale. Employing the medium of dance, the film explores a number of conceptual and choreographical ambiguities, not least the indeterminacies of identity and gender implicit in the use of costumes and masks. On a formal level Shonibare’s use of repetition and the lack of dialogue forgo the conventions of mainstream film and those associated with so-called realist narrative. The events represented in the film, despite their apparent historical remoteness, also resonate within contemporary political debates on the nature of power and the excess associated with authoritarian regimes. To read full interview, see “Yinka Shonibare in conversation with Anthony Downey.” BOMB 93, Fall 2005.